The culture of Odisha is a wonderful amalgamation of ancient history and modern trends. Its unique cultural heritage is due to the intermingling of three great religious traditions of Hiduism, Buddhism and Jainism.It is home to various tribes some of whom still live by their archaic customs and traditions which in turn contributes to the culture of Odisha. Most of Odisha's population is rural and agriculture is their mainstay.The rath Yatra or Chariot festival of Lord Jagannatha in Puris is a very well known cultural festival. Arts and crafts form an important of Odisha's culture with its sand art and palm leaf paintings.The rich handicrafts and the handloom textiles from here are unparallelled. There is also the art of silver filigree work and Ikat fabrics in unique styles. Stone carving is widely practiced in and around Puri though, there are other smaller centers as well.The horn work of Cuttack also deserves a special mention. Similarly, the paintings of Raghurajpur, a village near Puri, are also well known for their themes depicting various scenes from Indian mythology and those incorporating the three principle deities of the Puri temple-Jagannath, Balabhadra and Subhadra. Odisha has a great tradition of music and dance. 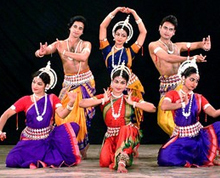 The fact that Odisha has a glorious tradition of music and dance is evident from the singing and dancing figures adorning temples in Odisha.The Odissi dance form which originated here is one of the oldest classical dance forms of India.The postures in this dance reflect the temple statues of Odisha. This dance extensively uses poetry of Jayadeva, who wrote on the life of Lord Krishna. Odissi classical dance is about the divine love of Krishna and his consort, Radha.There is also the Chau dance and Mahari dance which enjoy popularity because of the elaborate costumes worn by the tribal dancers. Another unique art form from Odisha is its puppet theatre with string, rod and also shadow puppetry. The themes are usually from the Mahabharata and there are some devotional themes as well.